One never knows what Nana will get into next. She has this thing for the unusual. Have you ever wondered about those funky birdhouses people have in their back yards? here's your chance to own one, too. Nana's out of her gourd when the new gourds come in from the garden. Each one suggests what it ought to be. Is it a birdhouse, a Christmas Penguinie, an Angel, an Easter Chick, a bowl, a piece of art deco, or maybe it is just a gourd. Whatever strikes her fancy, Nana will paint it. Birdhouses come with one of two hole sizes. The small hole (1 - 1.25 inch) is for Wrens, Blue Birds, and other small birds. The larger hole (1.5 inch) is for Nuthatchs, Titmouse, Finches, and Sparrows. The outdoor birdhouses have been treated with a weather proof spar varnish to help lengthen the life of the gourd. All outdoor birdhouses have been drilled to allow water drainage from the interior, warm air escape vent near the top, and are equipped with a copper hanger for you to connect to when placing your birdhouse in a tree. This unusual looking gourd bird house is colored and treated for outdoor use. It should be revarnished everyother year. The hole will accomodate a bird from small Wren size to American Gold Finch. Most birdhouses coms with a brass hanger already installed so all you have to do is find a great place to hang it and enjoy watching for nest activity. Some gourds lend themselves to specific uses. It is easy to see how a gourd with a neck could become a bird form. With some sanding, shaping, and painting, these gourds turned into a whimsical Duck and Flamingo. Bottle gourds make great Angels, Chicks, and the occasional Bunny. Larger gourds suggest what they should become just by their natural shape. Some gourds just look like they need to be made into apples, hence the name Apple gourd. Some others look like pears. Other gourds turn out looking like Strawberries. Small egg gourds are made into ornaments either for Christmas trees or for the Victorian feel of displaying elegant art pieces. Large gourds can be made into bowls to hold fresh fruit, holiday decorations, or centerpieces. This bowl has been randomly stained red and decorated using a melted wax technique. Smaller gourds might get a decorative rim treatment. This one is a simple woven leather with feathers to highlight the color of the gourd. The inside of gourds with trim are usually painted or stained to provide a nice complement. Bowls range in price from $8 - $15 depending on the amount of decorative touchs. Finally, some gourds are just gourds. They have a unique shape, or characteristic that needs to be highlighted. Some have a wonderful shape that can be appreciated as a decorative feature in your home. The price difference depends on the amount of decorative painting. Special orders are welcome. 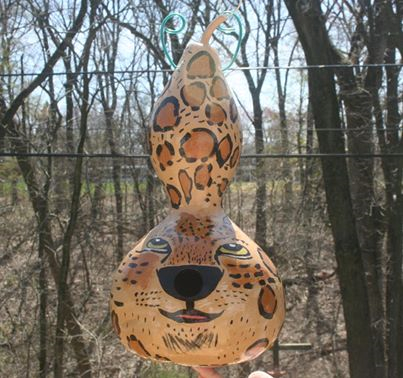 This Jaguar is a school mascot and was made for a silent auction. Crafted gourds are for sale. The ones pictured were made for craft sales and friends. Requests for custom decorated gourds are welcome. There is always a new selection that is not necessarily pictured with these on the web site. Prices range from $10 for small solid colored bird houses to $25 for large specialty houses or feeders. Nana will part with her gourds and arrange shipping to your United States address. Shipping fees are USPS and determined by the size of your order.